When the giant mountain-forming periods crushed Asia with the mass of the Indian sub-continent, more than the Himalayas sprang up. The mammals were profoundly affected by Tertiary and later tectonics. None more so than primates, who were forming ape and monkey lineages throughout tropical and other habitats. Recently, in Myanmar, an odd-nosed monkey was discovered. Always an exciting event, the primate discovery has livened up the whole of primate evolution. Sheltered, intermontane valleys were left with unique speciations, while many species then extant became extinct. The mainland orang-utan(but not obviously the island orangs) and Gigantopithecus (a huge animal much larger than a gorilla) were both lost in the most recent changes. The Hengduan Mountains are now supposed to have been the origin of the ancestor to the odd-nosed monkeys, which are a kind of Colobus. The ten spp. are shown in this map below, with the new species on the far left, near the Salween River (RSt = Rhinopithecus strykeri). It must be remembered that all the species are very rare, as they live in niches such as mangroves and high-altitude forest. R strykeri, for example was recently discovered in Myanmar and then also found in a part of SW China where it borders Myanmar. 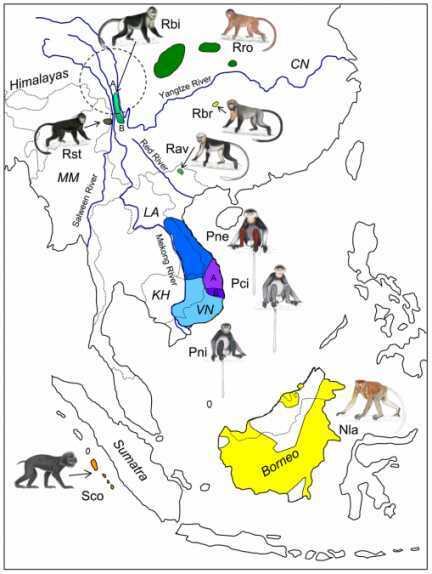 (Above) Idealized distribution map of the ten odd-nosed monkey species in South-east Asia. Hatched and blue lines indicate country borders and major rivers, and the Hengduan Mountain range as presumed centre of origin is depicted as dashed circle. Abbreviations used in the figure: Rro = R. roxellana, Rbi = R. bieti, Rst = R. strykeri, Rbr = R. brelichi, Rav = R. avunculus, Pne = P. nemaeus, Pci = P. cinerea, Pni = P. nigripes, Sco = S. concolor, and Nla = N. larvatus, CN = China, KH = Cambodia, LA = Laos, MM = Myanmar, VN = Vietnam. A and B refer to the distribution of main haplogroups of R. bieti and P. cinerea, respectively. The Rhinopithecus genus is regarded as a base for the evolution of the "odd-nosed monkeys", descended from an extinct genus called Mesopithecus. This animal was common at the Miocene/Pliocene interface, about 5mya, just before the major tectonic movements diverted the rivers to form huge barriers to the primates. Langurs (Semnopithecus spp.) became a group of SE Asian monkeys quite distinct from the odd-nosed monkeys, while island species shown here are relatives of Rhinopithecus that have survived to form extant "odd-nosed monkeys." The Rhinopithecus species suffered badly as forests were radically reduced and altered by geological change, not least in the courses of rivers. Other primates such as crested gibbons show evidence that they, too, were affected by these climatic and geological disruptions. Hainan island for example hangs on to a remnant of just two families of one species (a mere 20 sorry individuals). These animals are even rarer than the snub-nosed monkeys and all seven species are critically endangered, not to say neglected. However, at least the monkeys have survived long enough to give us an insight into the world of early human inhabitants in Asia, as giant apes and many other species adapted to the rapidly changing niches of the new valleys and forests.